Crop lien system was inaugurated in North Carolina in March 1867, when the General Assembly passed an Act to Secure Advances for Agricultural Purposes. Most former Confederate states passed similar laws during this time. They were made necessary by a post-Civil War cash shortage among both landowning and nonlandowning farmers, who found it difficult to purchase provisions for their families. Under the crop lien system, farmers could get fertilizer, farming equipment, groceries, and other goods by giving merchants a lien on their cash crops, the most desirable being cotton and tobacco. By providing credit until crops were harvested, merchants were allowed to charge higher prices for such purchases-usually adding a markup of 20 to 50 percent, but in some cases much higher. A rapid proliferation of country stores across North Carolina and the South was the result. Abuses in the crop lien system reduced many tenant farmers to a state of economic slavery, as their debts to landlords and merchants carried over from one year to the next. Many landowners joined the ranks of farm tenants when excessive indebtedness led to foreclosure. An 1887 report of the state's Bureau of Labor Statistics stated that the crop lien system had proven "a worse curse to North Carolina than droughts, floods, cyclones, storms, rust, caterpillars, and every other evil that attends the farmer." North Carolina leaders of the Farmers Union, which flourished from 1908 until the end of World War I, sought to abolish the crop lien system. Although ultimately not successful, they were able to see a bill go into effect in 1918 making it unlawful for merchants to accept more than 10 percent security above cash prices when goods were bought on time. A rapid decline in farm tenancy after 1940 brought a corresponding decline in the number of crop liens, especially those signed over to supply-merchants. Landlords and farm lending institutions still use crops as debt security on a regular basis, although under more stringent protective legislation. Hugh T. Lefler and Albert Ray Newsome, North Carolina: The History of a Southern State (1973). Charles P. Loomis, "Activities of the North Carolina Farmers' Union," NCHR 7 (October 1930). Stuart Noblin, Leonidas LaFayette Polk: Agrarian Crusader (1949). Near Duck, NC, ca. 1939. 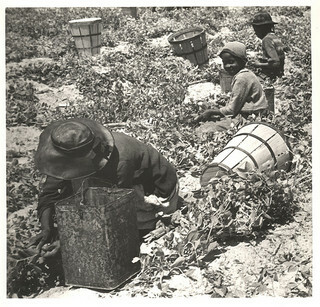 From the Farrell Photo Collection, PhC.9, North Carolina State Archives, call #: PhC9_2_85_36, Raleigh, NC. Available from http://www.flickr.com/photos/north-carolina-state-archives/3007384809/in/photostream/ (accessed September 10, 2012).